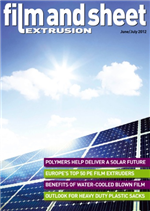 The June/July 2012 edition of Film and Sheet Extrusion is now available for viewing. Just click here to see the magazine in full, completely free of charge. Who are Europe's leading extruders of polyethylene films?